Assisted Outpatient Treatment (AOT) is also known as Laura’s Law (AB1421). AOT, also known as AB 1421 or Laura's Law, provides services for individuals who are experiencing a serious and persistent mental illness, who can benefit from treatment, but decline voluntary participation. Once an individual is referred, the AOT team will attempt to engage them in services on a voluntary basis. 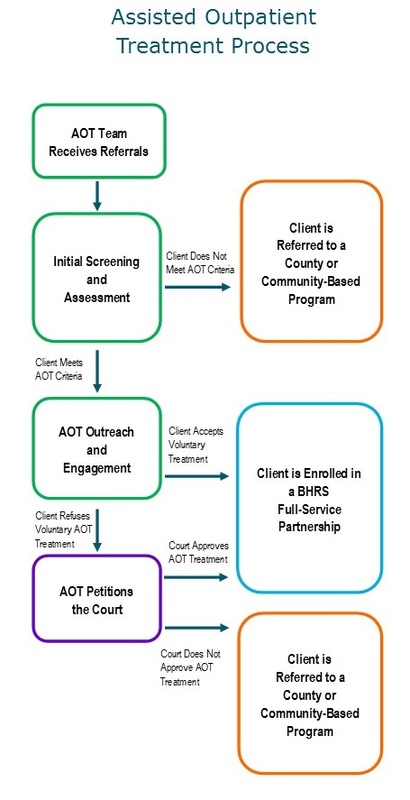 If the individual is still declining the recommended treatment, the AOT Team may petition the court with a plan and recommendation seeking court-ordered, involuntary outpatient treatment. Participants will be offered community-based, mental health services delivered by a highly trained, professional, multidisciplinary team. A peace, parole, or probation officer assigned to supervise the individual. To make a referral to the Assisted Outpatient Treatment (AOT) program please call (415) 473-4321. An AOT clinician will return your call to review your referral. Note: AOT is not a crisis intervention. If you or someone you know is experiencing a mental health emergency, dial 911 or call the Crisis Stabilization Unit at (415) 473-6666. Question: Are court-ordered clients required to take medications? Answer: No. The court may order treatment, but cannot compel medication compliance. Medication compliance is completely voluntary. Question: What if a referred individual does not meet AOT criteria? Answer: Clients who do not qualify for AOT will be referred to other county or community services. Open Monday through Friday from 1:00 to 3:00pm. Visit for support and information. Help Line staff are family members. We know your urgent need for sharing, support, information, and local resources. We are here to help.